Here is a super-simple infographic that popped into my inbox last week from Furthr, a new content marketing agency set up by Andy Pemberton. Andy is a former Editor of Q Magazine and a regular contributor to top titles both here and in the US. With Richard Scott supplying the design, that makes for a pretty powerful team. I get all sorts of email, but I really liked this item. It was so fast, direct and memorable, it made me think well of the business that sent it to me. Which of course, is the whole point of content marketing. It now seems that every brand in the land is wanting to tell us stories, serve us facts and generally entertain us with their fluency in generating and curating content. They have always done this of course, through customer publishing, but they are now taking matters into their own hands. P&G has invested heavily in Super Savvy Me, Coca Cola is moving from creative excellence to content excellence, and there will be more to follow. There’s a lot of debate about it too. 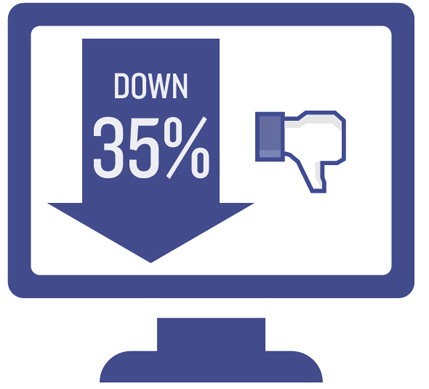 Read this post at Publishing Executive for an idea of the current landscape. However, there is so much content in the world, and so little time, that actually getting anything to be seen, read or looked at in any way at all is increasingly difficult. Which is why infographics are so very powerful. For a masterclass in how to make them, you can do no better than read this superb post at Fast Company written by Josh Smith, a member of the Brooklyn based design group Hyperakt. There’s tons of detail there, and lots of great examples. But as Any Fule Kno, this is still the original and greatest infographic of all time. Here is Charles Minard’s 1869 map showing the route and the nature of Napoleon’s 1812 invasion of Russia. A staggering amount of complex data displayed with the utmost simplicity. 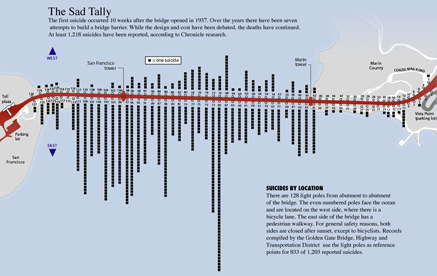 Although my personal favourite has to be this 2005 infographic showing the number of suicides from The Golden Gate Bridge, and the precise point from which they jumped. Brilliant work. For further reference, both Wired and Bloomberg Business Week do great infographics, and there are many good books on the subject. In particular, Information Is Beautiful, and the daddy of them all, Edward Tufte’s Visual Display Of Quantitative Information, which Amazon declared to be one of the ‘Best 100 Books of the 20th Century’.